The whole peer-review workflow is performed in the Editorial Manager online system. Manuscript submitted should contain original work, focused on the aims of this journal, should be clearly and correctly written in English, and should contain all essential features of a scientific publication. Submitted manuscripts are screened for completeness and quality of files and will not enter the review process until all files are satisfactory. In order to evaluate similarities with scientific literature, specialized text-matching software is used to screen all manuscripts accepted for scientific evaluation. The Secretariat will announce the corresponding author about the receipt and the status of the manuscript. Authors may suggest reviewers for their manuscript, whether invited to do so by the Editor or not. The Editor may choose to use one or more of these reviewers, but is under no obligation to do so. 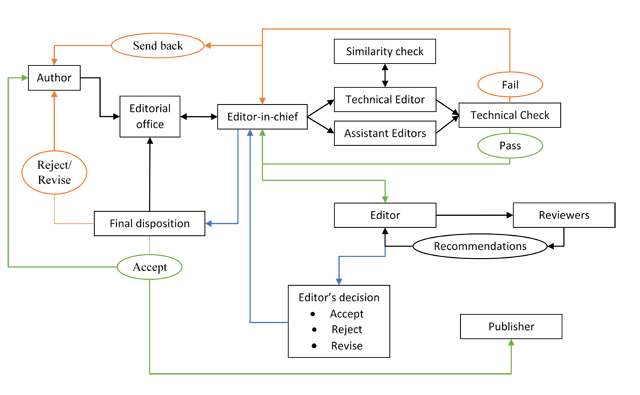 Authors may ask that certain people not be asked to review their manuscript, but Editors are not held to accept these requests either. The articles are sent to reviewers with expertise in the laboratory medicine area, without revealing the authors’ names and positions. Also, the reviewers’ identities are not known by the authors. Following the reviewers’ recommendations, the Editors decide if a paper is published or not. Submissions may be declined without external review as deemed appropriate by the Editor-in-Chief and the members of the Editorial Board. The authors of the manuscripts that have been rejected or need revision will be announced. Revised manuscripts should be resubmitted as soon as possible, but not later than 6 weeks. Although unusual, a resubmission may be rejected after revision if the response to suggestions and requests is considered inadequate. Authors will receive a pdf file with the edited version of their manuscript for final proofreading. This is the last opportunity to view an article before its publication. The purpose of the proof is to check for typesetting or conversion errors and the completeness and accuracy of the text, tables and figures. Substantial changes in content are not allowed without the approval of the Editor. After online publication, further changes can only be made in the form of an Erratum, which will be hyperlinked to the article.